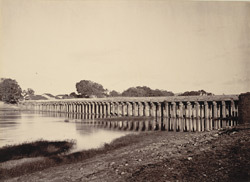 bl.uk > Online Gallery Home	> Online exhibitions	> Asia, Pacific and Africa Collections	> The Wellesley Bridge, Seringapatam. This photograph of the Wellesley Bridge, Srirangapatna taken in the 1890s by an unknown photographer, is from the Curzon Collection's 'Souvenir of Mysore Album'.Accompanying the photograph is this note: "Wellesley Bridge, over the Kaveri at Seringapatam, was erected in 1804, under the direction of Dewan Purnaiya, at the cost of 5½ lakhs, and named after the Governor-General, the Marquis of Wellesley. It is an interesting specimen of native architecture, being composed of stone pillars, capped with stone corbels, and surmounted by stone girders, on which the flags of the roadway are laid. Though rough in construction, the bridge has survived the heaviest floods for a century without injury."